Passion for opera and an infectious enthusiasm for chamber music is behind the innovative and unique vision of the ensemble minui. Living up to the latin meaning of our ensemble name minui, we perform a reduced version of works from the symphonic and operatic repertoire. The pieces are specially arranged by clarinetist Stefan Potzmann for this unique group of five string and four wind players. The process and result of these reductions offers the audience and performer alike a fresh perspective on the works. All members of the ensemble minui have played in Austria's leading orchestras and are currently members of the Kärntner Sinfonie Orchester. The constantly growing repertoire of the ensemble minui captivates with its rare qualities and flexibility. Apart from small-set standard chamber works, arrangements from symphonies and opera form the core of our repertoire. 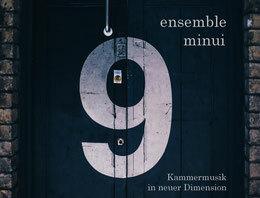 The ensemble plays, in contrast to the more standard nonet (four strings, five winds) with five string and four wind instruments, creating a distinctive and soft orchestral sound. Pieces marked with * were edited or arranged by Stefan Potzmann and are performed exclusively by the ensemble minui.